As a new driver, there are a lot of things to remember. Knowing when to get your oil changed, what to do when pulled over by a police officer, and understanding how to drive on snowy or icy roads takes a lot of practice according to Colorado traffic laws. 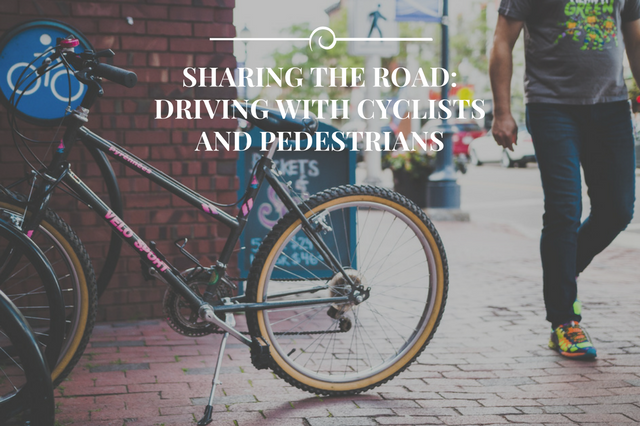 One of the most important things to remember as a new driver is how to safely share the road with bicyclists and pedestrians. Colorado has a plethora of cyclists occupying bike lanes, and a careless driver can seriously injure a cyclist by accidentally wandering into the bike lane. Furthermore, to the National Highway Traffic Safety Administration reported that 4,735 pedestrians were killed in a traffic accident in 2013. Drivers have to be conscious of the need to share the road. Here are a few tips on things you can do to be a safe and courteous driver. Many crosswalks aren’t clearly marked, and in many cities, pedestrians aren’t always going to cross the street on a crosswalk. As a new driver, you should always be aware of your surroundings, and if a someone is crossing the street in front of you, slow down until they’ve reached the other side. Always drive cautiously in areas with lots of foot traffic, on a road with a bike lane, and especially around school zones or neighborhoods where children might run out into the street to chase a ball. Always remember that pedestrians have the right of way. Even if you have the right of way, we encourage our students to yield to bicyclists and pedestrians. Many drivers get frustrated with cyclists on the road, but speeding by a cyclist to go around him isn’t the answer. Even if a cyclist decides to ignore the rules of the road and blow through a stop sign, as a driver, we all have the duty to protect those who are at most danger — pedestrians and cyclists. Getting distracted by phone calls, texting, or even looking out the side window at the scenery is a potential scenario for an accident. Many accidents occur when drivers drop something, say their wallet, and bend down to pick it up while driving. Even though this takes only a second or two, it’s enough time for a pedestrian or cyclist to come into your path, or for you to swerve dangerously into another lane. Bike lanes are intended for bikes only. Many drivers often drive in them if they don’t see any cyclists using them. But our field of vision in vehicles isn’t always clear. Cars have blind spots and are known weaknesses even for experienced drivers. Cyclists may wander into your blind spot without you noticing. If you are driving next to a bike lane, be aware of any cyclist in it. Parking lots are a minefield of distractions. Shoppers are pushing shopping carts, carrying bags of groceries, and trying to hang on to their young children. Slow down to 10 or 15 mph and watch out for pedestrians, cyclists, and even other vehicles who are not watching where they’re going. Should you ever make accidental contact with a cyclist or with a pedestrian, you as a driver will be at fault. Depending on the severity of the accident, your insurance will go up, you may lose your license, you can be charged. In the worst case scenario, a driver can fatally injure a pedestrian or a cyclist. Being patient and slowing down is the best prevention of collisions. Becoming a good driver takes time and practice. With WSDI’s Behind the Wheel Training course, you can take as many hours of practice as you need to obtain your driver’s license. Practice driving in a variety of areas including residential, commercial and highways according to the right Colorado traffic laws.